Every farm has a certain time of year when it offers pure delight. And early June is that time for the Iris Farm in Michigan.The farm small, at six acres, was once a cherry farm, but the soil, weather and birds pose constant challenges for fruit farmers in in northern Michigan. "Seventeen years ago, this fifth generation Leelanau farmer decided to no longer fight against the elements, and instead choose to embrace the offerings of his land," reports the Leelanau.com Blog about the farming family of William Black. "The family noticed that the iris plants blooming around the farm thrived." Smart farmers don't fight nature, and instead they study and appreciate its many whims. 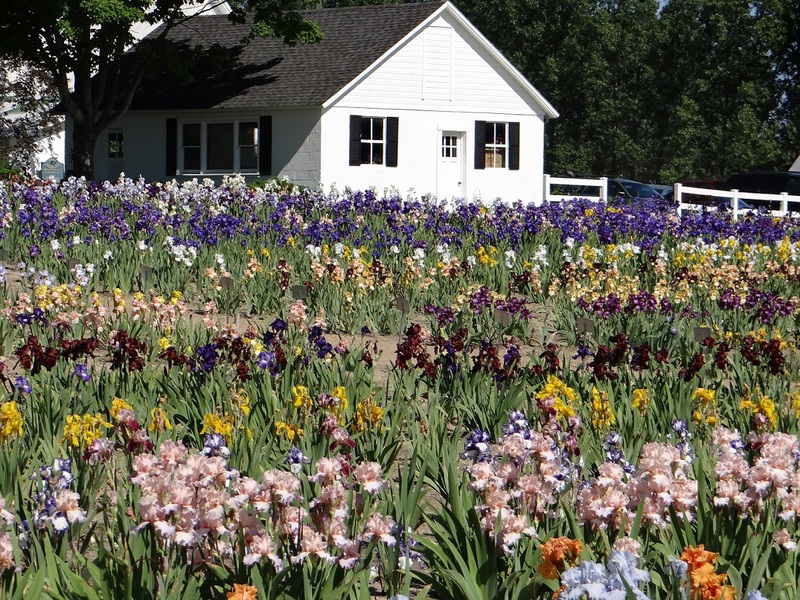 Today, the farm has more than 700 hybrids of Iris and several hundred of day lilies. The farm doesn't seem to have a website. Teh family doesn't do much advertising, but the two brothers are obviously delighted by the attention their new crop attracts. Passersby on Route M-72 recognize something special and slam on the brakes. The genus Iris has about 250 species - and the name comes from the Greek word for rainbow. So of course, I strolled along the rows of colorful irises, searching for Iris afghanica or some variation, but of course, those are not well suited for Michigan weather. "Iris afghanica is a striking species," report Malin Rivers and Richard Wilford, science editors of Kew Royal Botanic Gardens. "The slender, bluish-green leaves can be up to 30 cm long, though are often shorter, and the outer ones are sickle-shaped.... At higher altitudes the plants are more strongly coloured and only about 10 cm tall. At lower altitudes the flowers are larger and more softly coloured, and the plants can reach 25 or 30 cm tall." 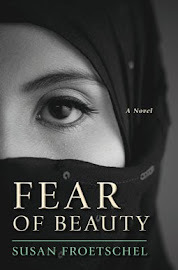 The plant was noticed by an iris collector in 1964 and named in 1972.And it grows among boulders and on steep rocky slopes at altitudes from 1,500 to 3,300 meters - and likely might be found in the mountains overlooking the imaginary village of Laashekoh in the novel Fear of Beauty. Iris afghanica has been cultivated, Kew reports, but is rare. It thrives in hot dry summers and freezing winters - with little rain and the Kew species is in Kew House. Kew Gardens in London has 300 acres of wonder and is a UNESCO World Heritage Site - with shopping is available online. So, Iris Farm has no Iris afghanica, but some other purple varieties will soon join my garden and offer memories well into the future, and I look forward to returning to Traverse City later this summer and retrieving my rhizomes. Photos of the Iris Farm, courtesy of Douglas Olsen. 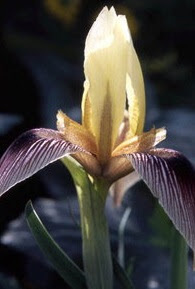 Thumbnail photo of Iris afghanica, courtesy of Kew Gardens and Richard Wilford.